Du Pont claimed their first win of the Premier Division season on a packed weekend of Bentley Bar North West Saturday Morning League action. 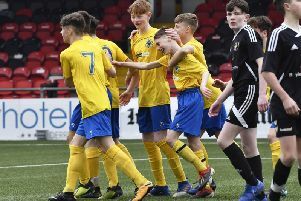 The Campsire side saw off Bentley in a close game while Westbank United edged out Hatmore Harps in a seven goal thriller, HML lost out to Tamnaherin Celtic and Creggan Swifts and Clifton Villa shared the spoils in a 2-2 draw. In the only other game in the top flight, Rosemount and Brandywell Celtic had to be content with a 2-2 draw. In the Championship, Phoenix Athletic Colts enjoyed a 8-0 win over Artigarvan while City Colts scored a last gasp winner against Sion. Clooney had an easy win over Foyle while Dungiven scored a late goal to defeat Newton Heath in a nine goal thriller. Strabane Athletic defeated Tristar 2-0 and finally Foyle Harps managed to get an easy win over Culmore. Saturdaym September 26th; Premier Division; Du Pont v Hatmore Harps (Du Pont); Tamnaherin Celtic v Westbank United (Lettershandoney); Clifton Villa v Bentley (Lisnagelvin 2); Brandywell Celtic v HML (Prehen No 4); Rosemount v Creggan Swifts (Showgrounds). Championship; Sion Swifts v Phoenix Athletic Colts (Strabane); Foyle FC v Artigarvan (Prehen 6); Newton Heath v City Colts (Lisnagelvin 4); Tristar v Clooney (St. Columb’s 2); Culmore v Dungiven (Culmore); Foyle Harps v Strabane Athletic (Prehen 1).